You are here: Home / Oh, Sofia: A Rant. With Gifs. The fourth annual Qatar Airways Tournament Of Champions Sofia is scheduled for October 30 to November 4, 2012 in Sofia, Bulgaria. Featuring top WTA players and next-generation champions competing in an eight-woman, round robin singles format (with the singles semifinals on semifinals day and the final on finals day), it offers $750,000 in prize money. Six players who have captured at least one International tournament during the year and who are not participating in singles at the season-ending WTA Championships will qualify for the event, plus two wildcards. Second, I’d like to break this down. Eight players, who are NOT the best players in the world, get a chance to compete at a tournament for lots of money and lots of points after the season is finished. The only requirement is that the members of the field be International Event Title holders. Except, of course, TWO of the players in the tournament are wildcards. Therefore, 1/4 of the field in the Tournament of Champions is not even a tournament champion. What’s wrong with wildcards? Well, usually nothing. At regular tour events they totally serve their purpose. But the Tournament of Champions, which is already lacking credibility to put it mildly, having A QUARTER OF THEIR FIELD NOT EVEN BE CHAMPIONS is absurd. Absolutely. Positively. Absurd. The reason why this is so absurd is because of the amount of points available at this pseudo event that takes place after the Year-End Championships. In 2009, Aravane Rezai won her first International Event title in Strasbourg and therefore qualified for the Tournament of Champions event in Bali. She was ranked No. 44 going into the tournament, which, it bears repeating, took place after the Year-End Championships. Ana Ivanovic won the tournament in both 2010 and 2011. (Remember, both years she was awarded a wildcard!) 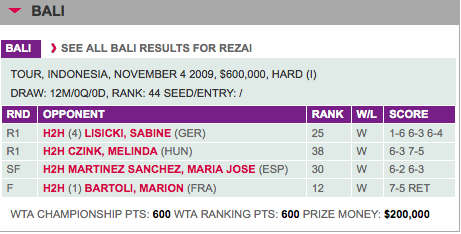 I suppose the WTA realized that 600 points was a bit extreme, so in 2010 and 2011 the winner of the event only got 375 points. The event also shrunk in size, and only required three victories to take the title. THREE. In 2010 Ivanovic’s victory launched her from No. 24 to No. 17 in the rankings–quite a significant leap. The 375 points were 15% of her yearly total. In 2011 the victory took her from No. 26 to No. 22 in the rankings, and accounted for 17% of her 2011 points. That is just a very high percentage. And honestly, it makes me angry. Because allowing this many points and this much money to be up for grabs in an event with absolutely zero significance that takes place after the WTA season has technically ended is just embarrassing. I have nothing against the players who take advantage of the event or the host cities of the event or even the structure of the event. It’s produced some nice moments, and I’m all for the round-robin format. But it is just not working the way it is now. It is undermining the entire WTA Rankings system. If the event is to continue, it needs to either: 1) be moved to a different time in the season; 2) revamp the qualification system; or 3) turn completely into an exhibition–money only. No points. Stop getting in your own way, WTA. It’s been a fabulous year. I’m really excited for Fed Cup to finish it. But it’s hard to stomach Wozniacki and Pironkova getting one final chance to surge up the rankings while everyone else is left at home. Time to go back to the good-old days when the Year-End Championships actually signaled the end of the year. ZOMG, wildcards! But, wait. The wildcards you list are all solid players, with large fan bases, either globally or in the regions where the tournaments have been held. Ivanovic won the tournament, twice. Date-Krumm, arguably the weakest of the wildcards, made the semifinals. ZOMG, it’s after the YEC! So, you’d be satisfied if the TOC and the YEC simply switched weeks in the calendar? But that would mean a shorter off-season for the players in the YEC, who have played more matches during the year than most other players. This year players in the YEC played an average of 71 matches, while those in the TOC played an average of 55. Why does the tournament’s position in the calendar threaten the rankings system? It’s a tournament with a small field and a defined qualification procedure. Those who get in get a chance to score points, and those who don’t get in don’t. That’s the case whatever time of the year the tournament occurs. Moving the tournament to the middle of the year would only make its qualification process even harder to understand. ZOMG, 600 points! That’s a whopping 130 more than a player gets for winning… New Haven. Obviously a threat to the rankings system. Except, wait. It’s not worth 600 points anymore. So you’re criticizing the WTA for something they’ve already fixed. ZOMG, 375 points! That’s a whopping 95 more than a player gets for winning an International tournament. Which they need to do just to qualify for the TOC. Obviously a threat to the rankings system. Yes, the Tournament of Champions’ name and timing at the end of the year invite some fans to compare its significance with the WTA Championships, a comparison from which it inevitably suffers. But to the players who play it, whether they’re young players having a breakout year, older players making a comeback, or established second-tier players, it’s a great reward for a successful season. And to fans who appreciate tennis on its own terms between players on a similar level, without demanding that the biggest stars have to be in the field or that the trophy ceremony come with cosmic significance, it’s fun to watch. Isn’t that ultimately what being a tennis fan should be about? Great counterpoints, Fogmount. I appreciate your thoughts and you certainly get bonus points for emulating the tongue-and-cheek style of the piece. The event IS fun, and as a hard-core tennis fan I want to be able to watch it an enjoy it, as it brings about fun match-ups and has a different vibe to other tournaments. However, the fact that it’s taking place after the season is over (meaning other players don’t have an opportunity to earn points that week) tampers my enthusiasm. I agree that the wildcards are established players with huge fan bases, and they certainly bring more attention to the event. It just seems unfair to me that they get a chance to earn points when the season is done for everyone else when they haven’t even earned it. And yes, the “ZOMG points” are comparable to the rest of the WTA schedule, but that doesn’t mean that I find them appropriate at an event that is so limited. I would love the event if it was an exo–still a chance to reward players for a great season with a chance to make more money and go to a nice place, but not to impact the rankings. Another point that has been brought up to me since publishing the piece is that the event is touted as being for “up-and-comers” when it is anything but that. The Wildcards are particularly not up-and-comer friendly–the only one who could fit into that box is Pironkova, and she was chosen due to the location, not due to her youth. 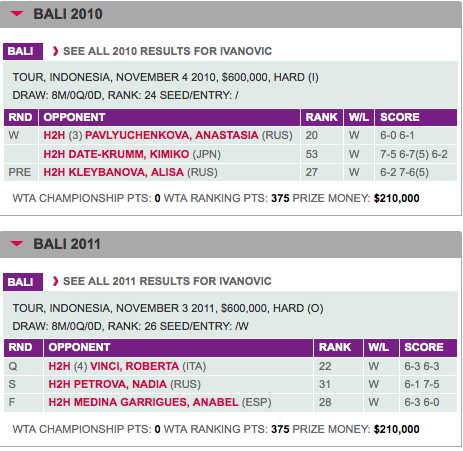 It seems like even the WTA is confused as to what this event is supposed to be, and some clarity would be nice. But the event makes money and attracts fun players, so it’s probably not going anywhere and it would be much easier if I just accepted it, especially since I love the WTA so much. Unfortunately as is I just can’t. Nice article Linz and I agree with you. Not to rain on your parade but I find it a bit strange that you are against WCs for the women at this ridiculous year end event, but that you would like to see WCs offered on the men’s side to their year end event. What is the difference? And wow–you certainly do have a great memory! You bring about a great point though, since I did recently ponder with Courtney over at SI what it would be like to have Wildcards at the ATP WTFs. However, since the conversation was so hypothetical, I didn’t consider the impact this would have on the rankings. After thinking about how much the Sofia Wildcards bother me, I’d have to say that if the ATP did ever have wildcards for the WTF (which I don’t think will ever, ever happen) then perhaps they should be able to play for money, but not for points. Or maybe a voting system should be in place for the Wildcards or something. But really you’re right for pointing out my hypocrisy and I’d say I’d amend my verdict to: no wildcards. Previous Entry: Changeover Chat: Bernard Tomic Stock – Buy or Sell?